Elective cosmetic surgery, already popular in the United States, is on the rise. This includes cosmetic breast augmentation, with women electing to undergo this surgery for personal reasons such as a desire to increase or change breast shape or size, or to restore breast fullness due to weight changes and/or pregnancy (Figure 1). Breast augmentation is the most common cosmetic surgery performed in the United States, and it continues to increase.1 As more women undergo breast augmentation, the visualization of implants during mammography will also increase. 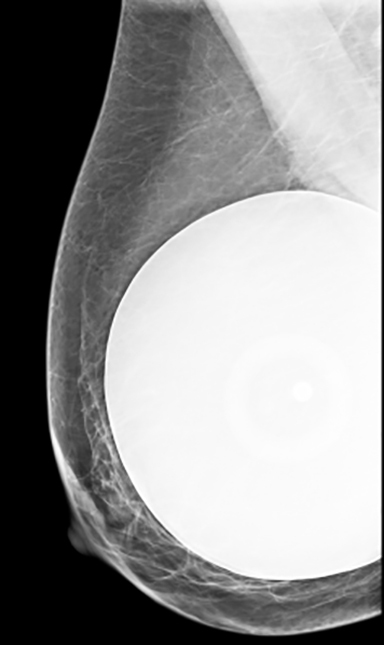 For radiologists who interpret either screening or diagnostic mammograms, an understanding of the diverse mammographic manifestations of breast augmentation can help produce a precise, accurate and relevant report that can help to provide optimal patient care. Surgeons may insert implants through several different incision sites (Figure 4). Where the implant is placed and positioned is called the “implant pocket.” Implant position is the location of the implant in relation to the pectoralis major muscle (Figure 5). The choice of incision site, implant type and position is driven by the size and type of implant, patient anatomy and patient-surgeon preference.4 Implants placed anterior to the pectoralis major are described as subglandular or retroglandular——behind most of the fibroglandular tissue in the breast but anterior to the pectoralis muscle. 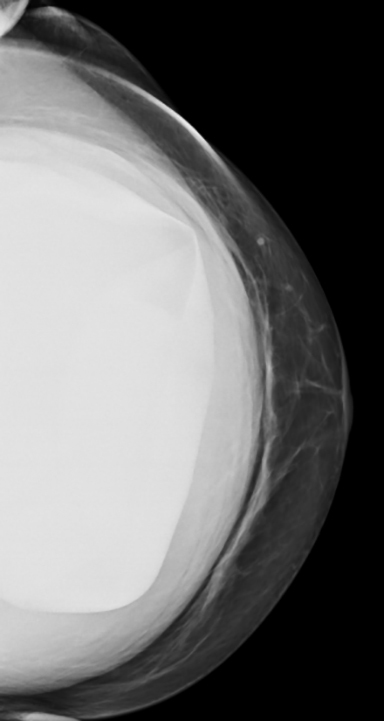 Implants placed posterior to the pectoralis major muscle are described as subpectoral or retropectoral.3 Discerning the implant position on mammography is often achieved on the non-implant displaced MLO view. On this view, both pectoralis major and the implant are seen, thereby most often discerning the location of the implant as related to the muscle. Implants placed in a retroglandular location demonstrate an acute angle to the inferior margin of pectoralis major. Implants placed in a retropectoral location demonstrate an obtuse angle to the inferior margin of the pectoralis major (Figure 3). Subpectoral implants are generally not entirely covered by the pectoralis major muscle, with only the superior portion of the implant covered by muscle. An additional implant positioning term is “dual plane,” a surgical term that describes how much muscle is released from the breast parenchyma, from the most inferior release at the inframammary fold to the most superior release, which is at the superior extent of the areola. Implants, regardless of lumen type, develop a fibrous capsule around the outer elastomer shell.6 This is normal; the body produces the capsule as it recognizes and walls off the implant as a foreign body. 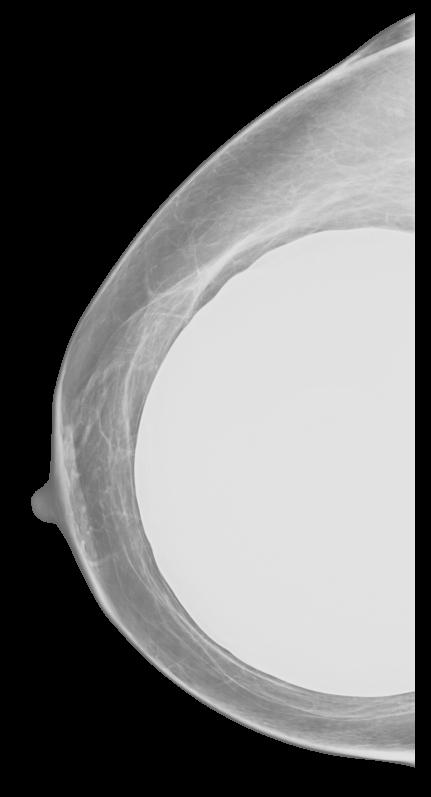 The surrounding fibrous capsule may or may not be discernible with mammography.3 However, being aware of the presence of this capsule is vital to understanding how silicone implants can rupture. There are 2 major types of silicone rup-ture, intracapsular and extracapsular.7 Intracapsular rupture occurs when the outer elastomer shell of the implant is breached, permitting the silicone to extrude from the shell but remain within the fibrous capsule. The elastomer shell in some way loses its integrity and leaks silicone, but since the surrounding fibrous capsule remains intact, the silicone remains contained. 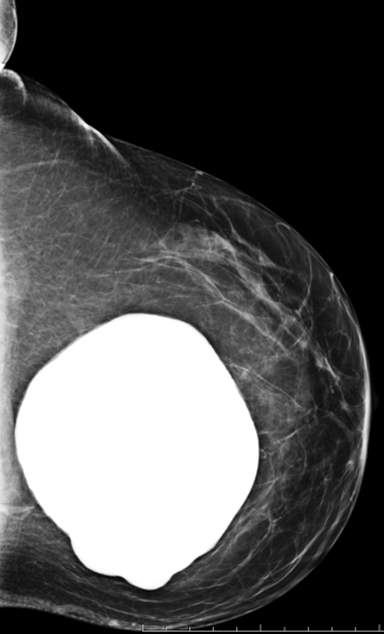 Since the surrounding fibrous capsule may or may not be discernible on mammography, combined with the high--density nature of silicone, intracapsular rupture is not a diagnosis that can reliably made with mammography. It has been reported that implants may be “suspicious” for intracapsular rupture based on a “distorted” appearance such as dis-homogeneous high/low density lumen and bulges, herniations or an irregular shape (Figure 8).5 However, these findings are not pathognomonic, sensitive or specific for intracapsular rupture. 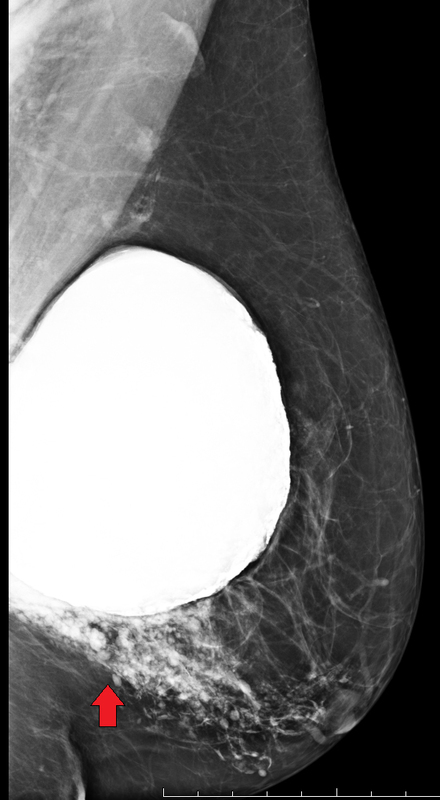 MRI is considered the gold standard for the diagnosis of intracapsular rupture, as it is the most sensitive exam for diagnosis of intracapsular rupture.5-7 Radiologists concerned about intracapsular rupture should consider a breast MRI implant protocol for further evaluation. 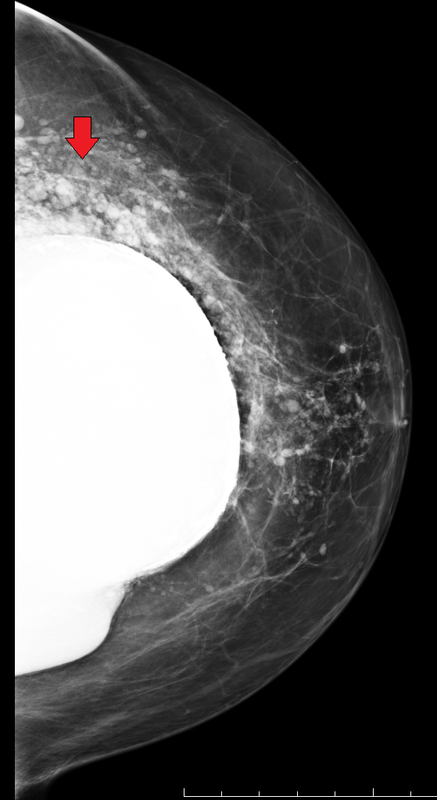 After identifying free silicone on a mammogram, either within the breast or in a silicone-laden lymph node, in which there also an existing silicone implant, it is not always clear if the free silicone is secondary to current implant rupture. Free silicone could be present and related to a previous implant that sustained extracapsular rupture but was removed and replaced with a new, intact silicone implant. When an extracapsular ruptured silicone implant is surgically removed (explanted), the surgeon may not be able to remove all the free silicone present in the parenchymal breast tissue. 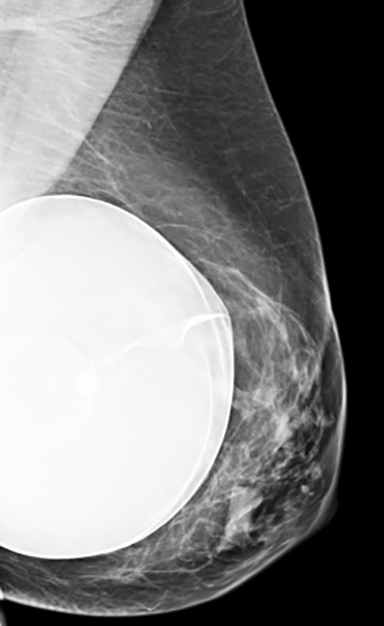 Therefore, it is not always possible to determine from a mammogram if free silicone is related to the present implant or to prior implant rupture and explantation. Reviewing the patient’s surgical history can often offer explanation. 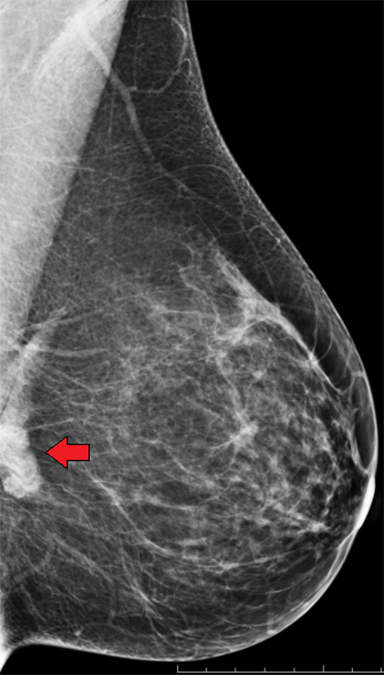 Yet in the setting of reading screening mammograms in which the patient is not available for discussion and/or the history form may not have been thoroughly completed, a clear surgical history is not always known and a differential of prior versus current implant rupture may need to be considered (Figure 10). Capsular contraction is the most common complication of implant breast augmentation. The fibrous capsule around the implant contracts and hardens resulting in change of breast shape, breast hardening and distortion. Possible associated imaging findings may include: Inability to posterior displace the implant on Eklund view, altered implant shape such rounded, irregular, tented, and visible thick capsule.3,6, 17 Capsular contraction, however, is classically considered a clinical diagnosis. Baker grades (I-IV) are a clinical assessment of capsular contracture based on the degree of breast hardening and immobility (Figure 15). Women with breast implants may undergo implant removal. There are various reasons for implant removal, some of which include a desire to reduce breast size, capsular contracture, rupture, infection, and patient dissatisfaction. As many as 20% of women who undergo breast augmentation have their implant removed within 8 to 10 years.18 When an implant is explanted, the residual fibrous capsule may remain or it may be removed (capsulectomy). During explantation, it is considered oncologically safe to leave the capsule tissue behind.19 The decision to leave the capsule versus capsulectomy with explantation is surgeon preference, with consideration for capsulectomy also given to the initial implant and whether the capsule can be removed in its entirety. 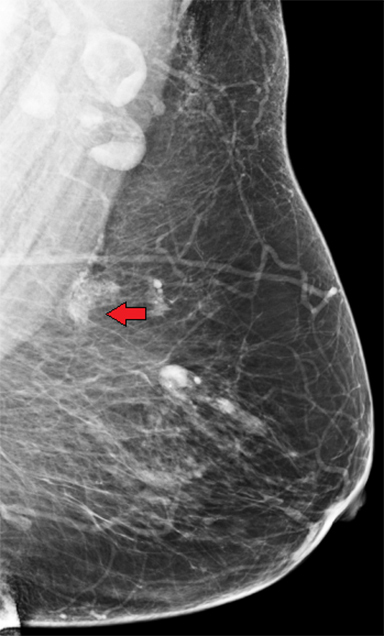 The mammographic sequelae of explantation are varied; in some degree they may depend on whether capsulectomy was performed. 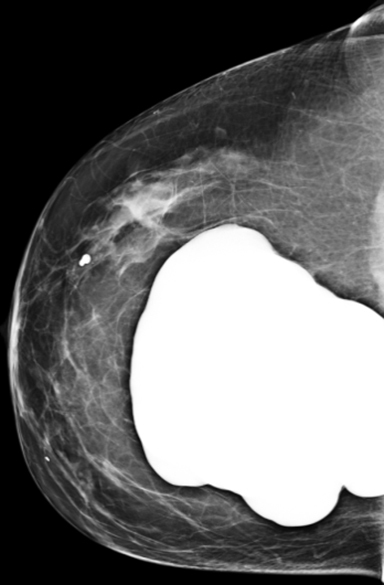 There may be no residual mammographic sequelae.20 A capsule that remains may be seen as a mass which can vary in size, shape and margins (Figure 16).21 The capsule may also contain calcifications. 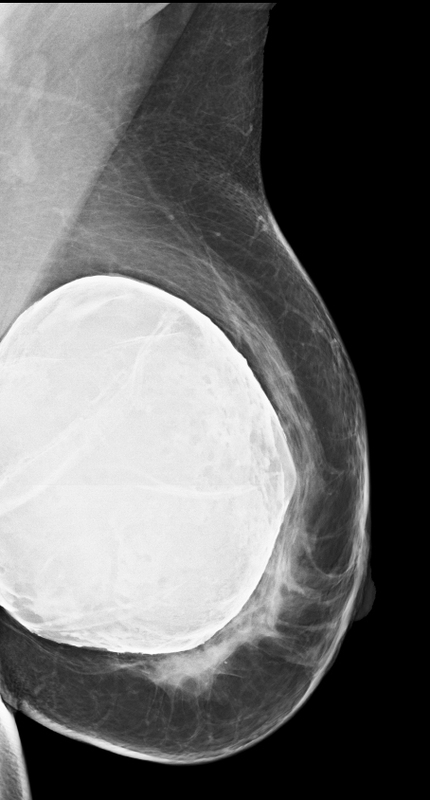 These findings are typically located in the mid-breast at posterior depth. If explantation was performed in the setting of extracapsular rupture, residual free silicone and/or silicone granulomas may remain (Figures 17 and 18). Familiarity with breast implants is essential, as breast augmentation is a popular elective surgical option. 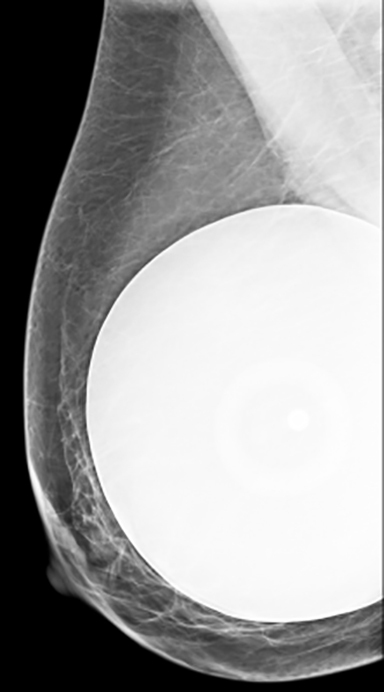 An awareness and understanding of breast imaging positioning as related to the Eklund technique can help centers provide high-quality mammograms for women with breast implants. 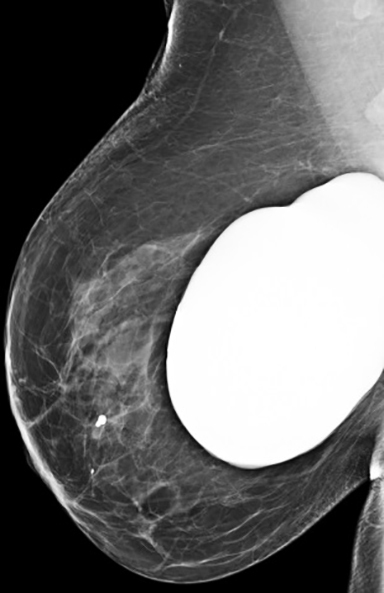 As women continue to choose this elective cosmetic option, radiologists must continue to improve their skills in mammographic interpretation. 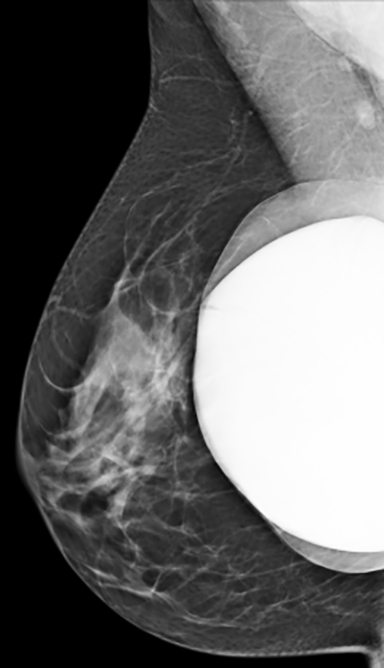 Patients with augmentation implants should be encouraged to participate in breast cancer screening programs according to the recommended guidelines. Plastic surgery procedures continue steady growth in U.S. American Society of Plastic Surgeons. http://www.plasticsurgery.org/news/past-press-releases/2014-archives/plastic-surgery-procedures-continue-steady-growth-in-us.html. Published February 26, 2014. Accessed October 21, 2014. Eklund GW, Busby RC, Miller SH, et al. 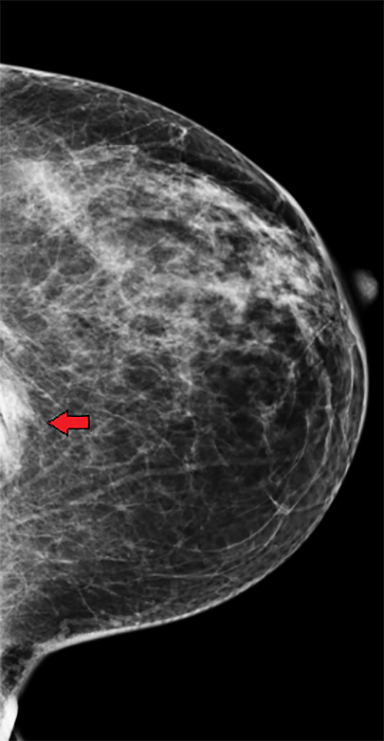 Improved imaging of the augmented breast. AJR Am J Roentgenol. 1988;151(3):469-473. 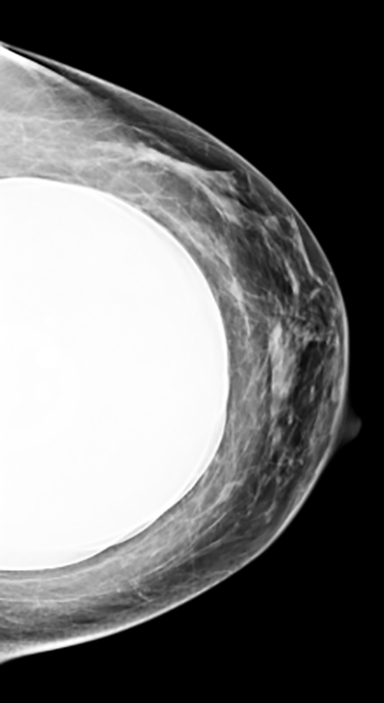 Venkataraman S, Hines N, Slanetz P. Challenges in mammography: part 2, multimodality review of breast augmentation-imaging findings and complications. AJR Am J Roentgenol. 2011;197(6):W1031-W1045. 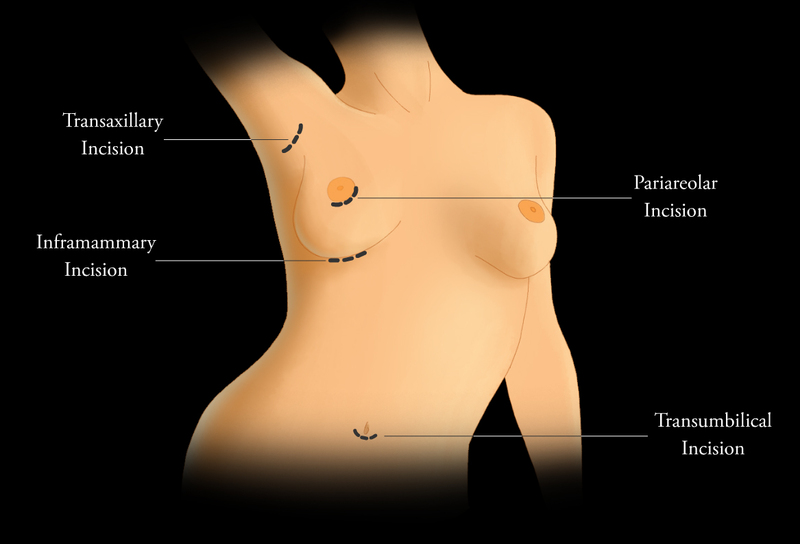 Breast augmentation procedure steps. American Society of Plastic Surgeons Web site. http://www.plasticsurgery.org/cosmetic-procedures/breast-augmentation.html?sub=Breast+au gmentation+procedure+steps. Accessed October 21, 2014. Di Benedetto G, Cecchini S, Grassetti L, et al. 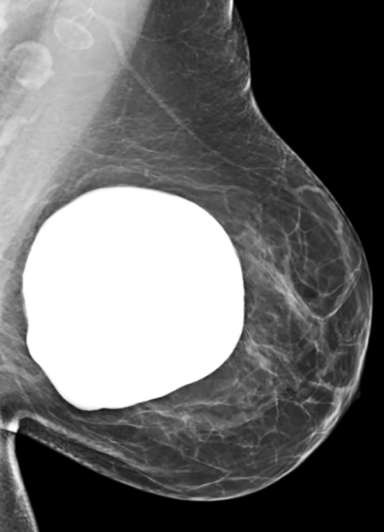 Comparative study of breast implant rupture using mammography, sonography and magnetic resonance imaging: correlation with surgical findings. Breast J. 2008;14(6):532-537. Bassetti E, Pediconi F, Luciani ML, et al. Breast prosthesis: management of patients after plastic surgery. J of Ultrasound 2011;14(3):113-121. Juanpere S, Perez E, Huc O, et al. Imaging of breast implants — a pictorial review. Insights Imaging. 2011;2(6):653-670. Colombo G, Ruvolo V, Stifanese R, et al. Prosthetic breast implant rupture: imaging-pictorial essay. Aesthetic Plast Surg. 2011;35(5):891-900. Leibman AJ. Imaging of complications of augmentation mammoplasty. Plastic Reconstr Surg. 1994;93(6):1134-1140. Important Information for Augmentation Patients about Mentor Memory Gel Silicone Gel-Filled Breast Implants. Mentor Web site. http://www.mentorwwllc.com/pdf/approved/Augmentation.pdf. Accessed October 21, 2014. Brody GS, Deapen D, Taylor CR, et al. Anaplastic large cell lymphoma occurring in women with breast implants: analysis of 173 cases. Plastic Reconstr Surg. 2015;135(3):695-705. Peters W, Smith D. Calcification of breast implant capsules: incidence, diagnosis and contributing factors. Ann Plast Surg. 1995; 34(1):8-11. Oliveira VM, Roveda Junior D, Lucas FB, et al. Late seroma after breast augmentation with silicone prostheses: a case report. Breast J. 2007;13(4):421-423. Locke MB, Lofts J. Variable presentation of anaplastic large-cell lymphoma in patients with breast implants. ANZ J Surg. 2015;. Doi:10.1111/ans 13074. (Epub ahead of print). Hwang M, Brown H, Murrin R. Breast implant-associated anaplastic large cell lymphoma: a Case report and literature review. Aesthetic Plast Surg. 2015;39(3):391-395. 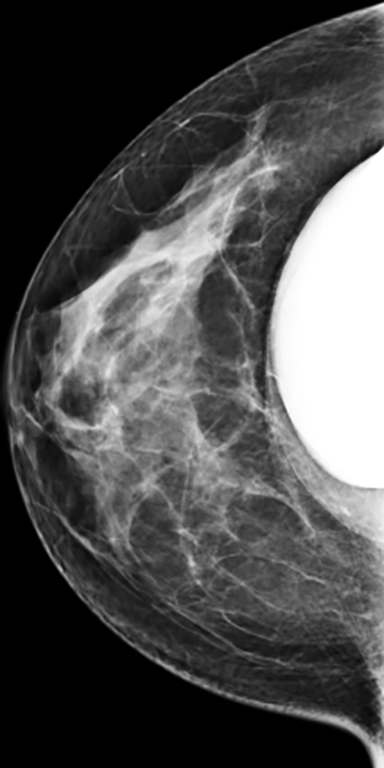 Uematsu T. Screening and diagnosis of breast cancer in augmented women. Breast Cancer. 2008;15(2):159-164. Risks of breast implants. US Food and Drug Administration. http://www.fda.gov/MedicalDevices/ProductsandMedicalProcedures/ImplantsandProsthetics/BreastImplants/ ucm064106.htm. Updated September 25, 2013. Accessed October 21, 2014. Lapid O, Noels EC, Meijer SL. Pathologic findings in primary capsulectomy specimens: analysis of 2351 patients. Aesthet Surg J. 2014;34(5):714-718. Hayes MK, Gold RH, Bassett LW. 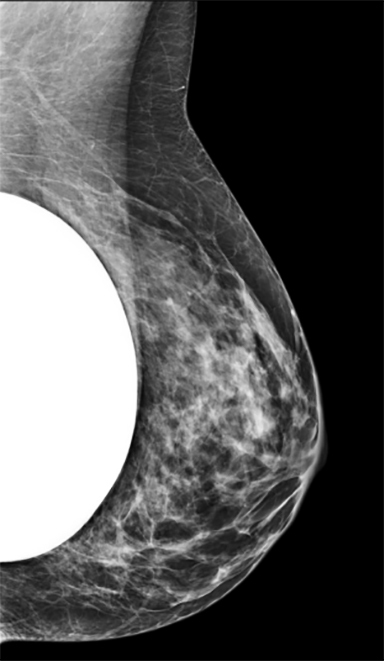 Mammographic findings after the removal of breast implants. AJR Am J Roentgenol. 1993;160(3):487-490. Stewart NR, Monsees BS, Destouet JM, et al. 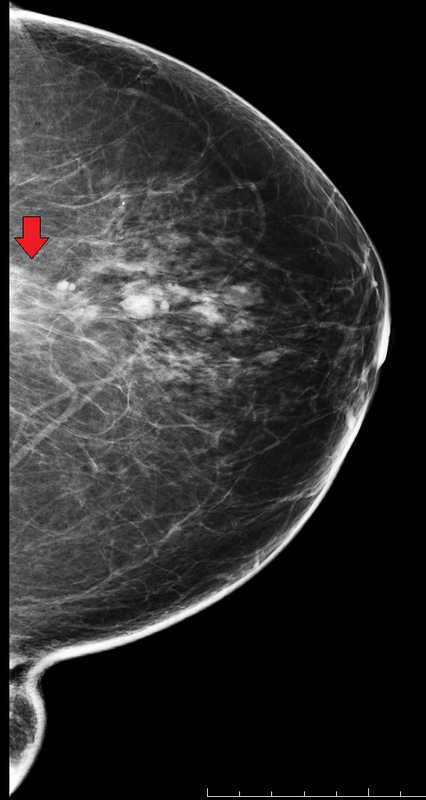 Mammographic appearance following implant removal. Radiology. 1992;185(1):83-85. Breast implants. US Food and Drug Administration. http://www.fda.gov/Radiation-EmittingProducts/MammographyQualityStandardsActandProgram/Guidance/PolicyGuidance-HelpSystem/ucm050244.htm. Updated June 25, 2014. Accessed October 6, 2014. FDA update on the safety of silicone gel filled breast implants. US Food and Drug Administration. http://www.fda.gov/downloads/MedicalDevices/ProductsandMedicalProcedures/ ImplantsandProsthetics/BreastImplants/UCM260090.pdf. Published June 2011. Accessed October 3, 2014. Quraishi MI, Herdt DR, Mizuguchi N, Calobrace B, Riley E, Roland LM. Cosmetic breast augmentation: A review of mammographic findings. Appl Radiol. 2016;45(2):26-33. Dr. Sarah Mizuguchi is a radiologist with the University of Louisville, Louisville, KY.; Dr. Quraishi is a fellow with the Department of Radiology at the University of Maryland, College Park, MD; Donald Ryan Herdt is a medical student at the University of Louisville; Dr. Nana Mizuguchi and Dr. Calobrace are with the Calobrace Mizuguchi Plastic Surgery Center, Louisville, KY.; Dr. Riley is with the Division of Medical Oncology in the Department of Medicine at the University of Louisville; and Dr. Roland is with the Department of Radiology at the University of Louisville. 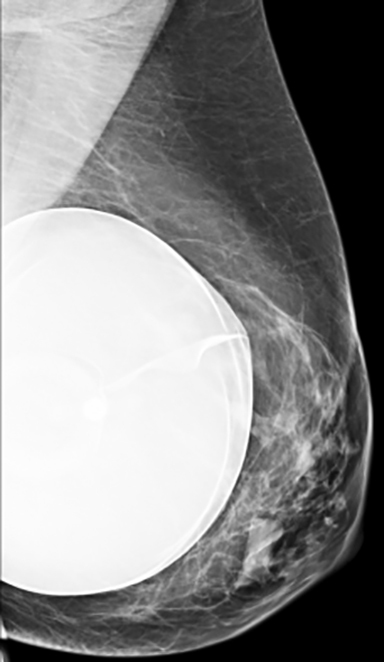 This article is based on a presentation, “The Cosmetically Altered Breast: Review of Surgical Techniques and Benign Radiological Findings to Aid in Interpretation of Mammography,” delivered by the authors at the Radiological Society of North America 2014 Scientific Assembly and Annual Meeting in Chicago.